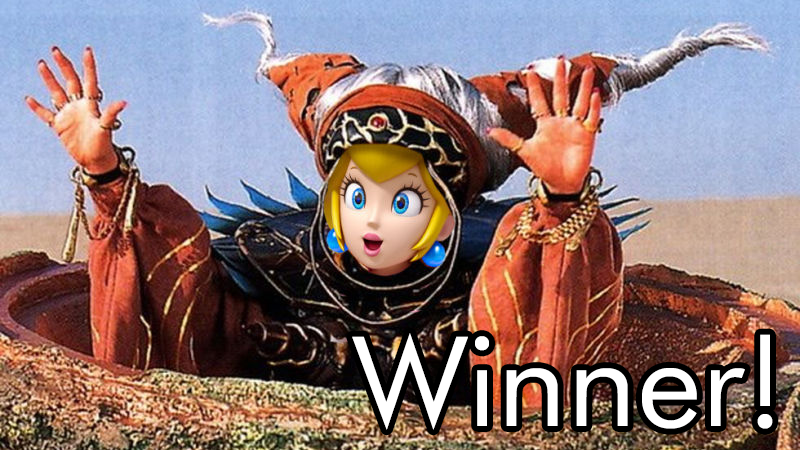 'Shop Contest: Princess Peach Forever, Winners! The Mushroom Kingdom is in turmoil. The divine right of princesses has been challenged. Princess Peach must assert her authority. I asked you to ‘shop up some images that promoted Princess Peach, and you did not disappoint me. When we talk about the Mario video game universe, we often forget about the political machinery that must be grinding away all the time. Like all aristocrats, Peach must be grinding away all the time to assert her power over her kingdom. The images below may be...disturbing...but they are all a part of a very serious political struggle. Our winner this week in an extremely tight race is soapypickles, whose Power Rangers-inspired design really gets at the true political nature of Princess Peach’s reign of terror. She’s the kind of ruler who is definitely going to jump out of some moon crater to scare the hell out of you. I encourage you to go look at all of the original entries because they’re universally high quality. The winner barely edged out in a serious competition between several honorable mentions, so really take a look at these. Bob made it clear that Peach can get down to the business of smashing things apart if the world gets out of hand. Xanshard went full propaganda. Now we know the true extent of her powers! Hylian99 begins a run of great propaganda with a simple message. NeoKenobi shows Peach giving us a message that everyone can get behind. cringer8, though, reveals that there’s something weird going on in the Mushroom Kingdom. Fakes? Gambon10207 shows that there’s something strange going on. Why does Peach need to present herself this way? Get_crazy gave us a companion piece with the same insidious message. MustangSaggy proves that there are several other people who are challenging the right to succession for the throne of the Mushroom Kingdom. ShizChiz demonstrates that Peach’s propaganda campaign must have something to do with buying video game consoles. drainpipe demonstrates that political sovereignty is developed through a body politic of which the Princess is the head. Villings shows off a lesser-known game featuring Peach. Burners Baby Burners found an excellent PR photo from a recent royal trip. Mortal Dictata also found one, possibly from the same trip. sciteach discovered what Peach is really all about. Chelsea of Tranquility is also concerned with jewels of a sort. Mrichston found a picture of peach showing off all of those skills she’s learned to be the best princess possible. iharm found the ultimate weapon. CS182 has revealed the ultimate royal crime. netsquire shows us how Princess Peach keeps all of these toadstools under control. That’s all for this week. Tune in tomorrow for the next ‘Shop Contest! &apos;Shop Contest: Make Hope County Weirder, Winners! &apos;Shop Contest: Bring Me Pictures Of Spider-Man, Winners! &apos;Shop Contest: This Is Where The Magic Happens, Winners!